From aft there are two quarter berths, one aft of the chart table on the port side and the other aft of the galley. The latter is in a small cabin of its own. The chart table is of a goodly size and the galley very usable and sea friendly. There is a very large coolbox with coolatron cooling system and a gas cooker with two burners, grill and oven. In the saloon there are three berths and an abundance of storage space. In the forecabin there is the head and a large double berth that can also convert to two singles. There is also a large hanging locker as well as much other storage space. In the forepeak is the chain locker. The rig is masthead sloop with baby stay. Mainsail, No 1 Genoa, Two No2 Genoas, No 4 gib, Spinnakker, Asymetric, storm gib and trysail. Most of the running rigging has been replaced in 2002. The standing rigging seems in good order. Mainsail has slab reefing and headsails are hanked on. Engine: Perkins Perama 25hp-1995 (few hours) ,20hrs since full service, two bladed prop. Water system: pressurised water with one interior tap and external shower (all new). Head: Lavac manual loo- new service kit and new piping. Bilge pumps: one manual, one electric (both new). Anchors: CQR, Danforth with 30m chain (new) and 40m rope (new) and Lofrans manual windlass (new). Electrics: Nasa VHF, Stowe log and echosounder, Radio cassette player with 6 cd changer (new). Two maintenance free 105 amp batteries (new) with 15 amp optimised charger (new). The 12v electric system is all new and there is also a 240v system (new) with lighting and 4 double sockets. There is also a built in TV and video in one of the saloon cupboards. All upholstery is new, nearly all through deck fittings have been replaced or bolts replaced, new windows in saloon, all paint and vinyl new, 80% of woodwork new. The bottom was epoxied with 3 coats of Veneziani epoxy as a preventative measure in 1998. She was last out of the water in June 2002. All old antifouling was removed and two coats of epoxy primer and two coats of antifouling applied. This boat has in 2001 and 2002 undergone a total refit, most of the equipment is new and the general condition is excellent. 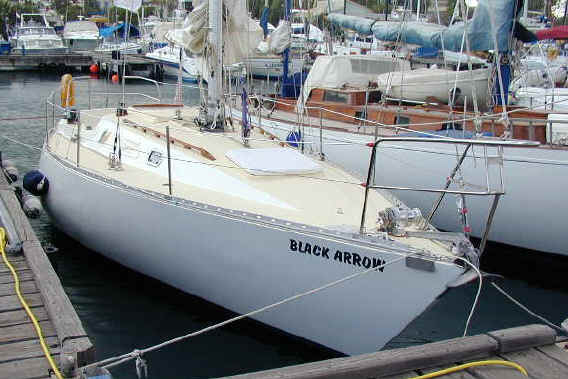 This is a well respected design and very good sea boat with outstanding performance, she is also a race winner. There is a survey report available dated July 2002. She is duty paid and registered in Cyprus.